If you look down a couple of entries you'll see the details of the Steel Audrey CD Release I was part of in October at St. James Hall. It was a memorable evening, with family and friends coming together to celebrate Derek Kehler's life and talent. The concert was recorded and my two contributions (both written by Derek) are here. 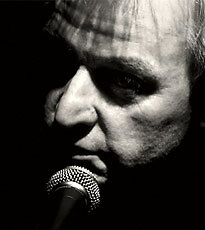 "Fears Of My Father" was performed solo and was followed, with the band, by a rocking version of "Beat Up Old Hobo" . The band included: Matt Rogers, from the blues duo "Harpoonist and the Axe Murderer", Scott Smith from The Reckoners (guitar), Eric Neilsen (bass), and Liam MacDonald (drums). I've just finished three 10-hour days at Afterlife Studios recording the bed tracks for nine original songs. We'll go back in about a month for another three-day session to overdub lead vocals, lead guitar parts, also mandolin and 12-string guitar and various percussive instruments. It's sounding good so far, to say the least. The songs - to my surprise, I didn't realize I was such a romantic - are all about love. Good, bad, and otherwise. Leaving, coming together, all kinds of love. The genres range from swampy ZZ Top style to Fleetwood Mac harmonies (all in the same song!) to a waltz-tempo country tune, and the rest are in the pop/folk catagory. I expect the release will be out in February. We'll have a preview track or two before then. I'm also excited about another recording project I've started with Michael Schau at his Axis Music Studio in Gastown. This might end up as an EP or maybe a full album. We've got two tracks recorded so far. This collection of songs, is just me and Michael, imagining we're sitting on a porch somewhere in Louisiana, passing a jug of whiskey, and playing the blues - and recording the results. We've got an original called "Bring Me Some Whiskey" done and a version of Robert Johnson's "Stop Breaking Down". The final product will be released, when it's done. 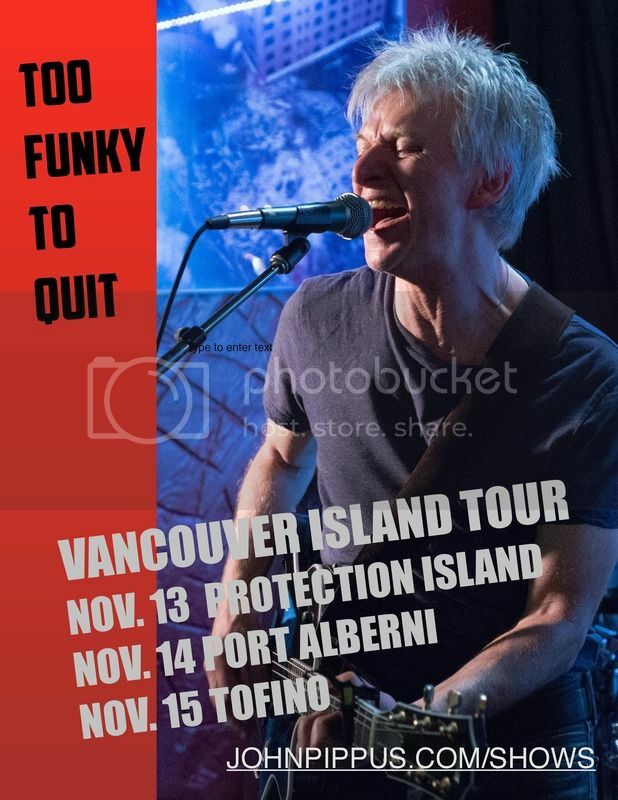 I'm heading over to Vancouver Island this Friday for three dates. I'll be joined by Beaver T. (guitar/vocals). We start out on Friday night at The Dinghy Dock Pub on Protection Island (a short passenger ferry ride from Nanaimo), then Saturday night in Port Alberni at Char's Landing - my third visit to this converted old church with wonderful acoustics - and finish up on Sunday night at Jack's Rainforest Inn in Tofino out on the wild west coast. More details on my "shows" page and links to each venue. If you're in the 'hood, or have Island friends who would like our music, you know what to do! 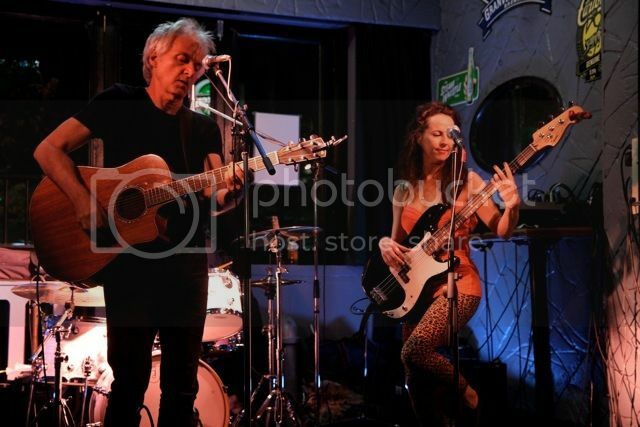 Two nights ago I was one of a dozen or so Vancouver singer/songwriters playing at Steel Audrey's CD Release. Steel Audrey was Derek Kehler's performing name. He died in a camping accident, along with his girlfriend, in June of this year. I knew him for eight or nine years. We played together and ran into each other at various songwriter evenings. He was a warm, gentle, and honest guy. He was only in his early 30s when he died. Derek recorded an album but it was not released at the time of his death. His family and friends undertook to complete the project and raised enough money to see it through. This Release Party was also a way for a lot of us to have one more coming together to remember our friend and colleague. I was asked to play two of his songs, so I chose "Fears Of My Father" and "Beat Up Old Hobo", from his previously-released EP. I'd heard him play these songs many times and I loved them both. Derek's parents, sister, and aunts came out from Manitoba for the event. It was an honour to play Derek's songs for them and the good-sized crowd who filled the hall. By learning the songs, I was given new insight to what an excellent lyricist he was. And his subtle use of seemingly simple chord patterns. 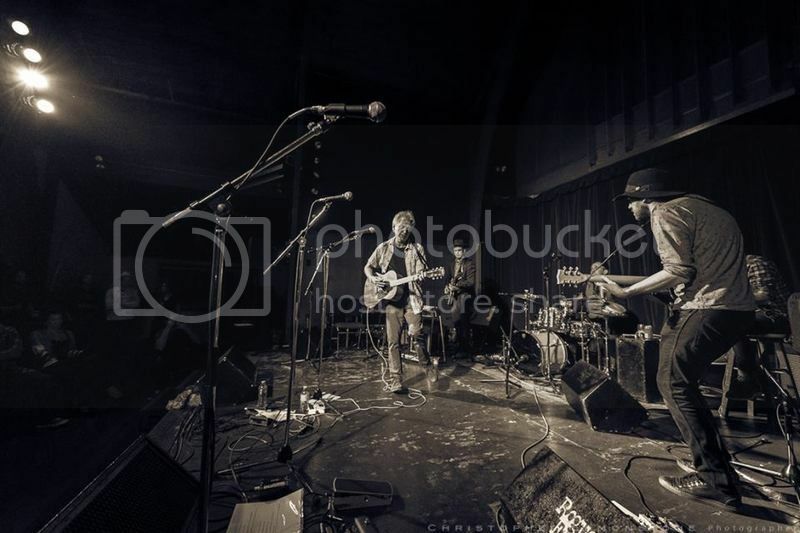 In the above photo, I'm playing a rocking version of "Beat Up Old Hobo". That's Matt Rogers, from the blues duo "Harpoonist and the Axe Murderer" on the right playing electric banjo. We were also joined by Scott Smith (guitar), Eric Neilsen (bass), and Liam MacDonald (drums) on this tune. I also performed "Fears Of My Father", solo. This is a slow 3/4 tune that starts "Kiss of my lover be soft and be sweet...". 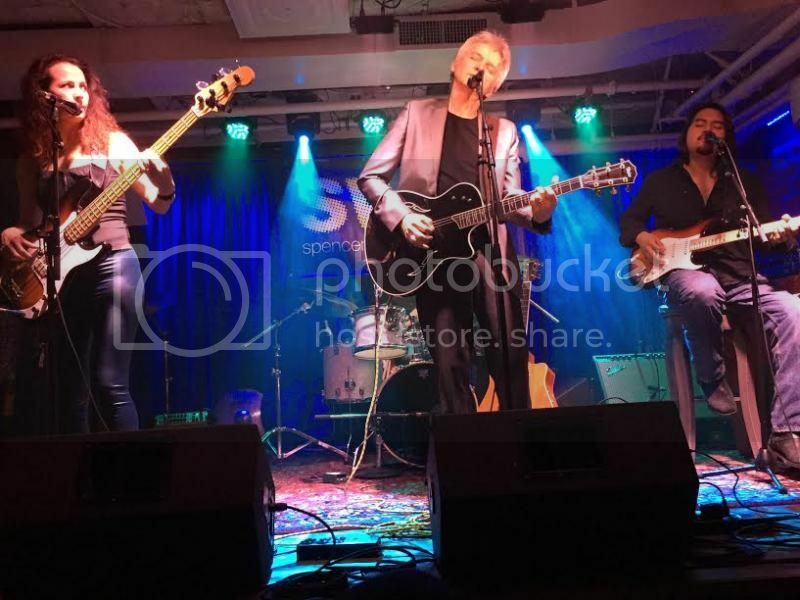 The evening was one of those nights when you are happy and proud to be a performing songwriter. As I told the audience - and in particular Derek's family - I'll be playing these songs now wherever I perform and telling future listeners about my friend and his life. That's one way his memory and work will live on. Peggy Wilson has been playing bass with me for a year now. I really appreciate the way she holds down the bottom end - very precise, she plays just enough notes. Not too many and never too few. She keeps it interesting without overdoing it. Peggy has a huge network of friends too, she's the band's unofficial Social Networking Queen. She's learned a ton of my original songs during this past year and together we've learned a lot of danceable covers. It's been a fun ride so far. I'm looking forward to many more gigs with Peggy. Photo by Tom Quirk. The Ivanhoe Pub, Sept. 12/15. The complete version of "Son's House" is below. It's Monday night now, as I write this. It's my Saturday. Tomorrow, Tuesday, is my "day of rest". Then a busy week kicks in. A pre-taped TV appearance, an outdoor festival, two nights at a posh hotel lounge gig in Whistler, and our regular-as-rain weekly Wednesday gig at Caffe Roma on Commercial Drive. "Son's House" is a song I wrote in tribute to Eddie "Son" House. I went to Rochester, NY, a few years ago and wrote about my visit to the neighbourhood where he lived for three decades, and about the man and his music in general. Paul did an excellent job on sound, picture, and editing. Super impressed with his work ethic and manner too. Big thanks to Paul and Shaw TV for the opportunity to get my music to a wider audience. So that's on TV tomorrow night, and then repeated ad infinitum. Then on Wednesday the band convenes at Caffe Roma, now into our ninth month of our weekly residency. Thursday is a duo gig at The Sylvia Hotel on beautiful English Bay. Friday, I'm hosting at Trees Coffee House as usual. I've been doing this gig for 9 1/2 years(! ), hosting, and sometimes playing, solo/acoustic. Then on Saturday afternoon the band plays at Harrison Hot Springs (about an hour's drive East of downtown) playing a 45 minute set at an annual event called "Bands On The Beach". Thinking about what to play. Some country, some covers, and of course some originals. But 45 minutes is not a lot of time to stretch out. So we'll see. Maybe I'll decide once we get there and suss out the vibe. On Sunday, another duo gig. This time at (ahem) the Fairmont Chateau Whistler. A two-night stand, playing in the Mallard Lounge. Looking forward to hanging out in Whistler for a couple of days. Thinking about what to wear. Jeans and t-shirt might get me barred. We'll be breaking out the new, Aussie-made foot stomper for some added oomph. Tom Harrison at The Vancouver Province newspaper has been a big supporter of my music since I started releasing albums. His weekly round up in the daily newspaper is a great place to find out what's happening on the local scene. Today's column talks about my 3-song EP, "The Hindenburg Affair". Read the column here. Tom says, in part: "... [there is] a slight change of direction to a laid-back, Bob Dylanish and countrified blues. Shows a band gelling". Speaking of recording, we're planning on heading in to the studio next month. I'm not committing to an album, even though I have enough new songs to go that route, but in an age of singles and Youtube, it just might be a series of single releases. We'll see. We were playing at a particularly picturesque setting last night. On a wharf on the Fraser River out in Maple Ridge (about an hour's drive east of downtown Vancouver). It was a warm Monday evening. As we played the sun was setting, small boats went past on the river and our Bose P.A. system was doing a fine job of amplifying our sound. (Our wonderful P.A. deserves a blog entry all its own!). There was a crowd of about 100 or so, sitting on the wharf in their lawn chairs enjoying the music. As we were playing, I was able to take in the scenery and just enjoy the moment of being there and sharing our songs. It's at times like this when I'm reminded why we put up with all the hard work, frustrations, etc. that goes hand in hand with performing in a band. It's doubly satisfying seeing my son Jake, (my drummer for 4 1/2 years), having a great time as well. 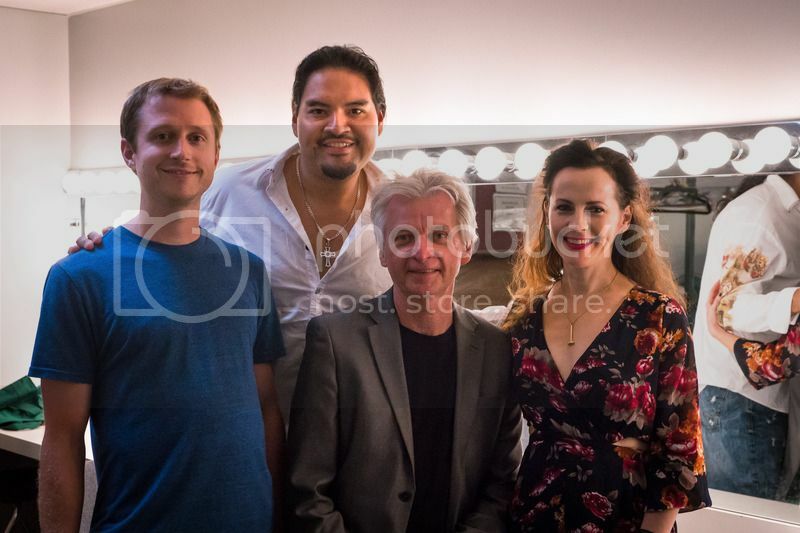 Speaking of memorable gigs, the photo (taken by Brook Thompson) was shot backstage at The Genesis Theater recently. It was another gig where we had an ideal setting to play our music. We've got a few more outdoor festivals coming up this summer (see the "shows" page), and I'm looking forward to more magical times. Here's an interview I did with the blogger at Trees Coffee House, where I've been hosting their music nights for nine(!) years. I talk about how I go about booking the talent, my own songwriting path and this 'n that. Have a read! And take a look at my 'shows' page. Lots coming up this summer, including some outdoor festivals. 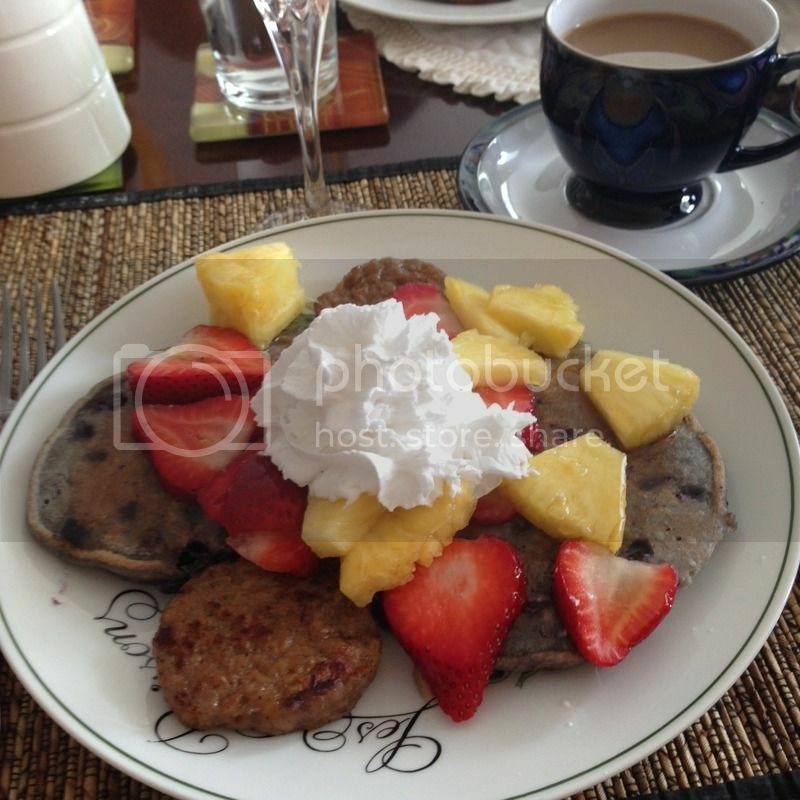 Yesterday my daughter and her husband came over with all the ingredients for a vegan Mother's Day brunch. And they brought my precious and delightful and fully original 2 year-old grandson too of course. And then my son Jake arrived with his girlfriend. He brought flowers and a card. 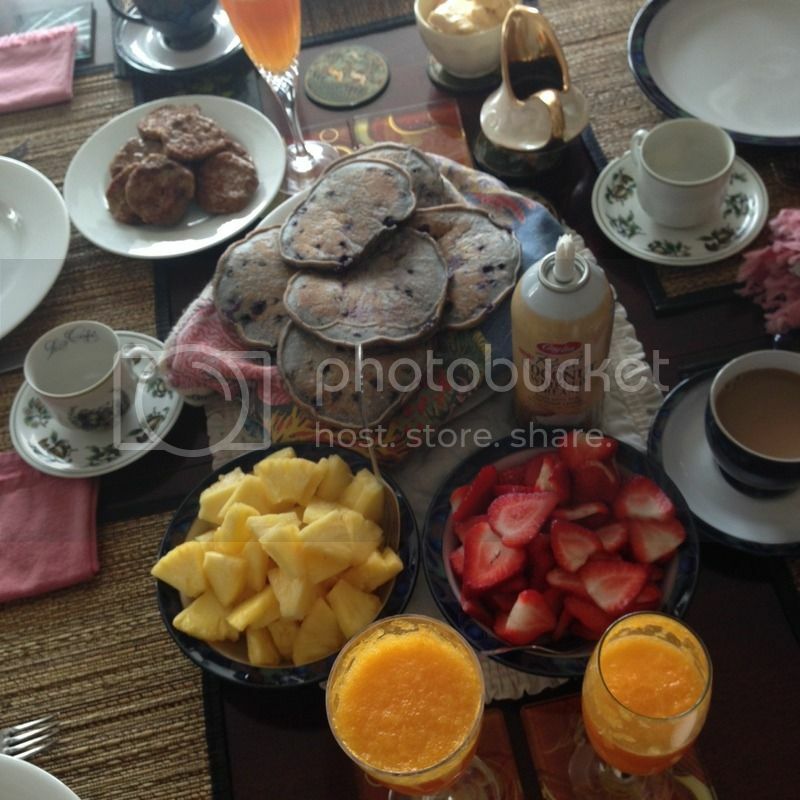 And we all talked and waited for the blueberry pancakes and breakfast sausage and mimosas (made with real oranges and Spanish sparkling wine) and strawberries and pineapple to arrive on the table. And coconut whipped cream from a can too. Like I say, all vegan. First you smear on the Earth Balance. Then add some maple syrup. 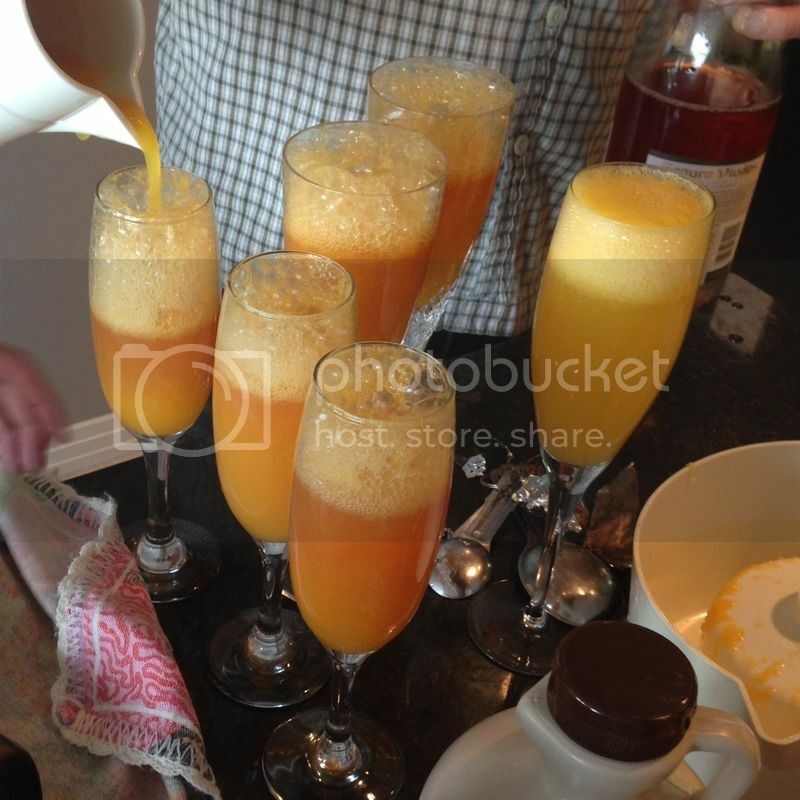 How to make a perfect Mimosa: Get a bag of oranges, squeeze out the juice (we used a juicer), add sparkling wine. In May it will be nine years since I took over booking and hosting the Friday Music Nights at Trees Coffee House. It's been a lot of fun, for the most part, and I'm going to continue on for the foreseeable future. 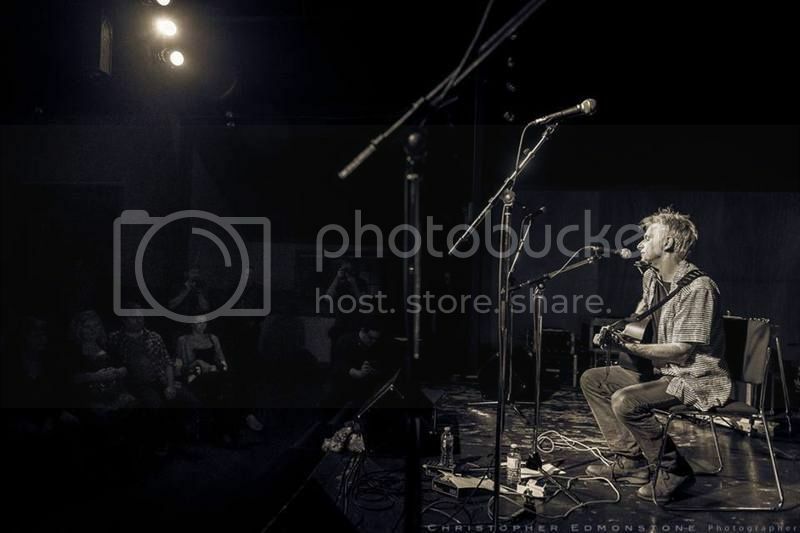 Here is a picture of me performing solo/acoustic last month. The photo was taken by my friend Kristina Lao. With the help of radio promoter Bryon Tosoff, we've been getting a lot of downloads from radio stations around the world, all picking up on the new EP, "The Hindenburg Affair". Stations in the USA, Canada, Australia, the UK, and several European countries will be playing tracks in the coming days and weeks. Making music is one thing, but getting it heard is also part of the equation. Playing at The Ivanhoe Pub. Photo by Brook Thompson. Rustzine, an Atlanta. Georgia music magazine has just reviewed the new EP, "The Hindenburg Affair". The article is posted here. Rustzine has been a long time supporter of my music, and I'm really grateful for that. Rustzine says: "We've been big fans of this Vancouver bluesman and his friends for years now and they've just released The Hindenburg Affair a name-your-price EP. Since we last visited with John about his album Howl At The Moon, bassist Peggy Wilson has joined John and son Jacob Pippus, and this three-song EP showcases more great blues and good times. 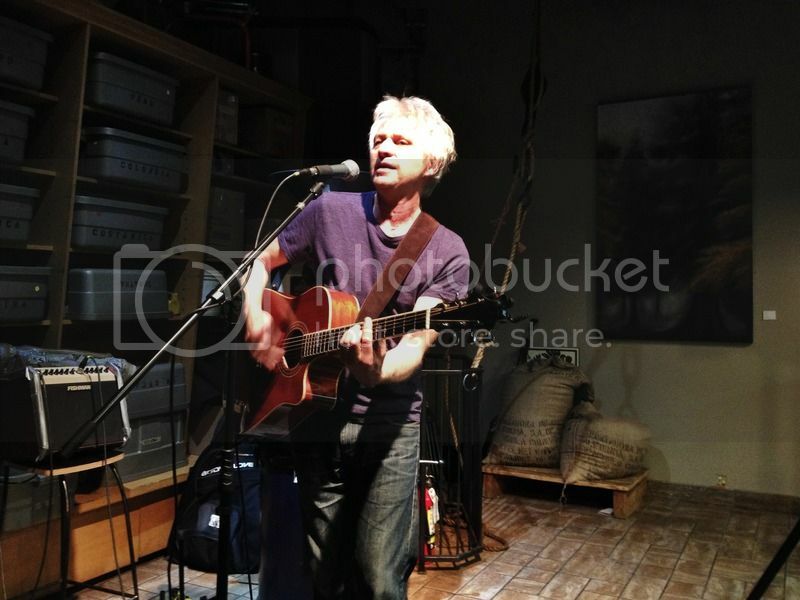 John Pippus has always been a crowd-pleaser and we play his music at our live RUST events and at parties frequently. So if you're looking for some classic blues with a fresh vibe, check out The Hindenburg Affair! You can read the interview here. It's long! And wide ranging. I talk about my greatest failure, greatest success, dealing with doubt, my definition of "happiness" and a whole lot more. Twelve questions in all. Looking at the answers now (much different than when you are just blabbering away) in cold, hard black print, I think I come off OK. That's a relief (or maybe it was just Christine's kind editing at work). And, on top of that, I have a new friend who knows a whole lot about me that I hadn't really thought about before. 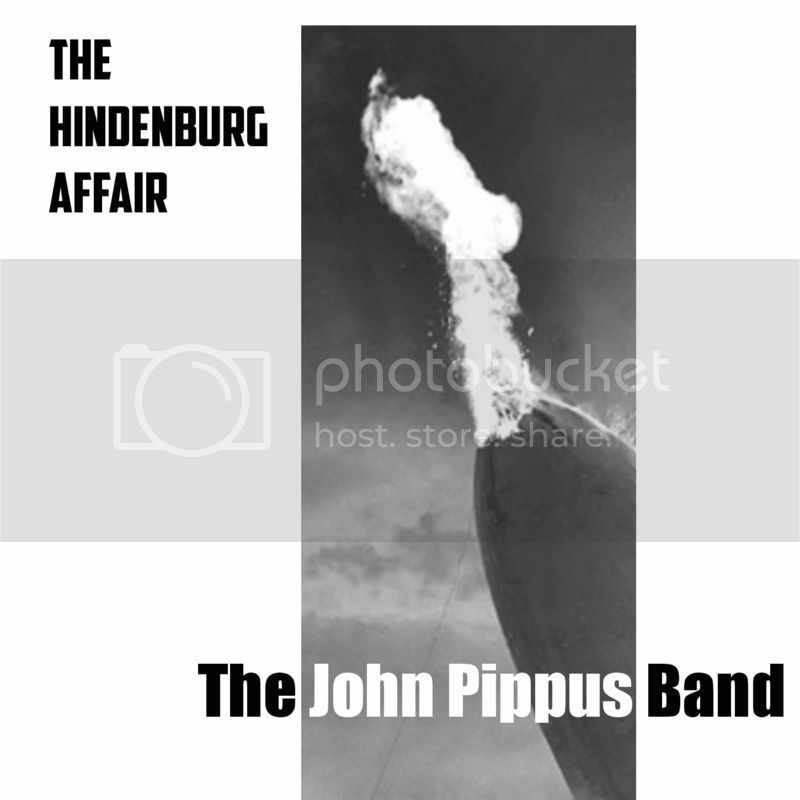 You can get our new, three-song EP called "The Hindenburg Affair" on my music page . Have a listen! And order a CD or download. You can read about the making of the EP there too. The three songs are the soundtracks to a video shoot we did in November. Along with "Burn" and "Call Me The Breeze", these three songs comprise a video EP we're calling "The Hindenburg Affair". Check it out on the youtube channel (link via my 'connect' page). Coming soon, a limited run audio-only EP to sell at shows and to send to radio DJs. There is a lot happening. We're working on new material and planning a studio album. 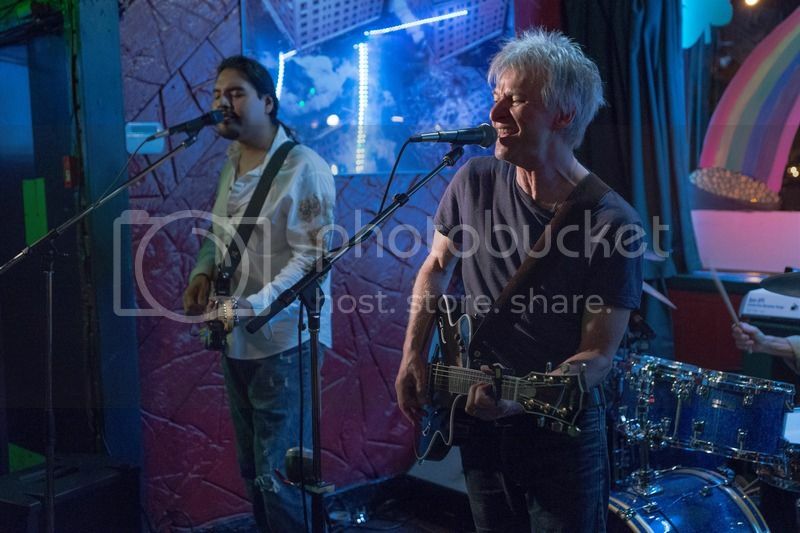 A lot of gigs are coming up (see the "shows" page for details) and we continue to grow our weekly residency at Caffe Roma on Wednesday nights. It's turning in to quite a scene with musical guests being featured each week. Summer festivals and a couple of tours are in the works as well. Photo by Monica Trejbal. At The Belmont Bar on Granville St. in January. We were performing as part of a monthly showcase hosted by The Mix. This song is a co-write with Aynsley Leonard. It's an uptempo, country blues in double drop D tuning. It started, as a I recall, with the basic riff and then Aynsley came up with the first line, "You broke a wine glass over my head...". Right there we had a whole situtation ready to be filled in with details. Was it a fight? What was going on? The next few lines came quickly after that and we had a low-rent motel scene between two sketchy lovers caught in a dysfunctional relationship. One of my favorite topics for some reason! I kept playing the riff and Ayns kept coming up with lines. It seems to me she wrote most of the lyrics and i would just nudge it along here and there as we got stuck.